While driving to a photo workshop not too long ago, I traveled a stretch of highway in Idaho. In the span of two miles, I passed seven animals killed on the side of the road. They ranged from deer and elk, to a badger, coyote and even the massive bristle-quilled body of a porcupine. The Humane Society of America estimates that every day, more than 1 million animals are killed on our roads and highways. I, too, have been that driver. The souls of a pheasant, bat and a juvenile black-tailed prairie dog weigh heavily on my conscience. The grief that burst out of me in those moments was a mixture of great loss and self-loathing. Their lives existed one moment, and not the next because of me. Here I am, the conservation photographer. I notice the animals that line our roads everywhere I go. 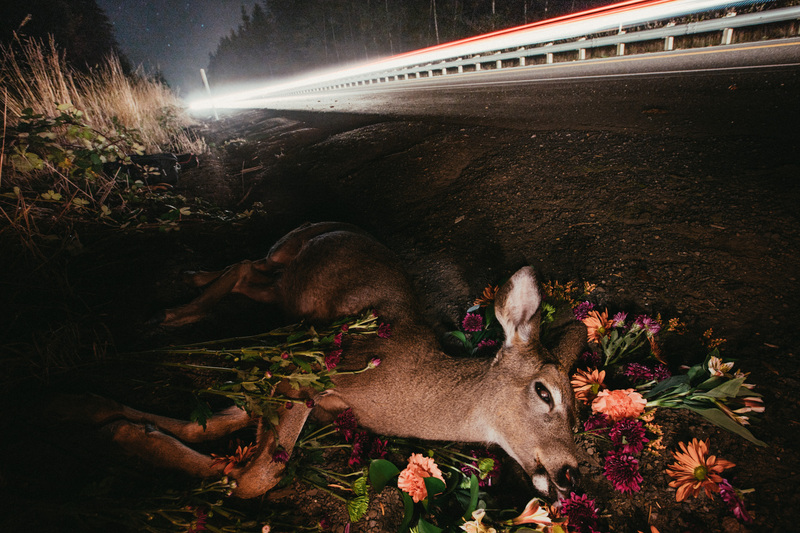 Deer alone account for roughly 1.3 million accidents a year and lead to billions of dollars in damages and injury. I also notice that we keep driving by as if this all means nothing. There are many roads left to travel, and species to pay my respects. I don't expect the world to stop driving. But perhaps as this project grows it can be used to help, whether it's to support funding for wildlife crossings, or reduced speed zones, or simply for people to notice. "A Last Leap Towards Flowers" began, and remains, a means to express my love and grief for the animals we lose to our roadways. I know their souls are long gone by the time I find them, but I can't help from wanting to give them one last moment of dignity and beauty. To let them know, "I see you. And you were loved."